As another spring begins, we eagerly await asparagus season. We were lucky to find these young asparagus tips and enjoy this lovely salad. This was so tasty, we are looking forward to making it again as the season develops. The pears are very nice with the white asparagus. If the asparagus is white, you will need to use a vegetable peeler and shave the outer wood skin off. Cut the tough bottom edge of the asparagus, and cut in bite sized pieces if the asparagus is large. It was the beginning of the season when we made this recipe, enabling us to get asparagus tips. Bring a large skillet with lightly salted water to boil and place the asparagus in the skillet. Cook (boil) the asparagus for 5-8 minutes until tender but al dente. Drain and immediately place in icy cold water. Prepare the salad dressing by mixing the ingredients together and whisking well to mix. Place in a dry frying pan and lightly toast. This will only take a minute or two, watch the walnuts carefully as they are quick to burn. When done, remove from the frying pan and place in a small bowl. Cube the non-dairy cheese in small pieces. Peel and slice the pears into a bowl with a splash of lemon juice. Prepare the mixed salad greens, washing and spin dry. Place the prepared mixed greens on individual salad plates. Drain the asparagus and lightly shake water droplets off. Arrange the asparagus on each plate. 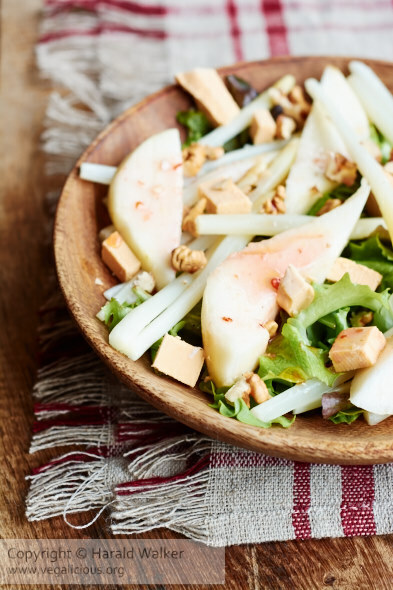 Place a few pear pieces decoratively on the plate with the asparagus and greens. Sprinkle the walnuts and non-dairy cheese on top and drizzle the dressing over the salads. Green asparagus and other fruits can also be used with this nice salad. Green asparagus with strawberries is also a delicious combination. Posted by Chris Walker on April 2, 2015 in Asparagus, Pear, Salads, Soy cheese, Walnut.